Robert Logan in 1822 was described by Governor George Simpson as the best settler in the Red River Settlement "without exception". Though a prominent figure in the history of the Settlement Logan was not one of the Selkirk Settlers, his career (as a fur trader) having begun some years before the arrival of Lord Selkirk's first group of colonists. 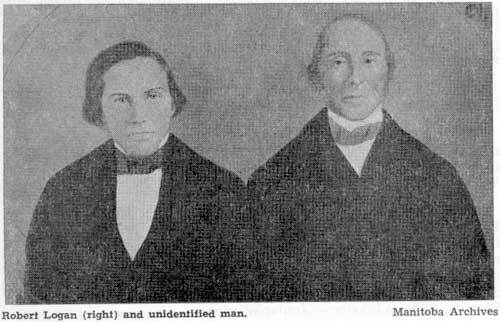 Robert Logan (right) and unidentified man. When he joined the Hudson's Bay Company in 1814 Logan had already served as a clerk at Sault Ste. Marie with the rival North West Company. Although he had decided to leave the fur trade Colin Robertson, whom he met at Quebec, persuaded him to accept a post with the Hudson's Bay Company. 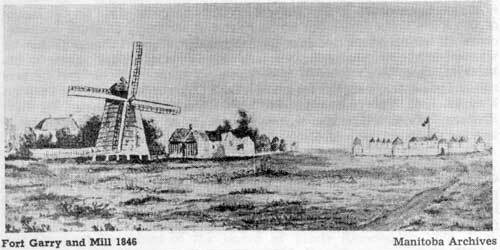 His first task was assisting in the arrangements at Montreal for Robertson's expedition to the Athabasca. With John Clarke in charge Logan travelled into the interior with Robertson's advance brigade. Logan spent the winter of 1815-1816 at the post of Ile a la Crosse, the following year at Rock Depot, and was at Rainy Lake in 1819 when appointed to take charge of Lord Selkirk's affairs at Red River during the absence of Alexander McDonell, the governor. This appointment was the end of Logan's career as a fur trader. He remained in the Settlement to become one of its leading citizens and to serve as a Councillor of Assiniboia. In 1825 he purchased from the Lord Selkirk estate the property on which Fort Douglas stood along with a grist mill then being constructed. Lord Selkirk's letter to Governor McDonell and the agreement under which Logan purchased the land and mill were recently placed in the Manitoba Archives by a descendant of Robert Logan and are printed in this issue of the Pageant. In my letter of Nov'r 9 & Febry 25, I acknowledged yours of Aug't 30 & Septr 13. Having concerted with the Directors of the HBCo. to allow Mr. Logan to go to the Settlement in your place, I trust that he has relieved you so as to admit of your revisiting your family according to your anxious desire. My letters of Feb'y 25th would inform you of my anxiety on account of the schemes of the N. W. Co. to arrest Capt'n Matthey in order to break up the Settlement again, which leads me to regret the necessity of your coming away at such a crisis: but necessity has no law. I think it probable that this may meet you at York Factory on your way home. You will observe among the letters for Red River, one ad-dressed to the officer in charge, which you will read & forward, & I request your attention to the different persons & things that are to be forwarded. I am Dear Sir Yours etc. P.S. I do not recollect whether I desired you to give Mr. Logan copies or Extracts of my letters to you, so as to put him in full possession of my Instructions relative to the management of the Settlement. If that has not been already attended to, I trust that you will send such extracts now by the boats that go from York Factory to Red River. The state of my health has not allowed me to write to all those whose letters I have to acknowledge. Be so good as to make my apology to Mr. Thomas Sen'r - Mr. Graham, Mr. McPherson, & Arch'd McDonald - also to Mr. Mich'l McDonell, if he is within reach. Mr. Graham proposed to send some Flags & Medals to the Sioux, which could not be properly done, now that the late Treaty has thrown their country within the American lines. An Agreement made this Eleventh day of June one thousand eight hundred and twenty-five between Robert Logan of Red River Settlement of the one part and the Executors of the late Thomas Earl of Selkirk by Governor Pelly their Agent of the other part as follows. The said Robert Logan hereby agrees to purchase from the said Executors of the late Thomas Earl of Selkirk the Wind Grist Mill now being erected with the old Establishment of Fort Douglas comprising one hundred Acres of land for the sum of Four hundred pounds Sterling payable as follows - Vizt. one hundred and fifty pounds on or before the 1st June 1826 - one hundred and fifty pounds on or before the 1st June 1827 and one hundred pounds on or before the 1st June 1828 - And the said Robert Logan further agrees to grind any Grain or Pulse  that may be brought to the said Mill from Settlers or others at a moulter  not exceeding that which is established in Canada to be deter-mined by the Gentlemen of the Catholic Mission. It being well under-stood that the said Mill shall be put into the possession of the said Robert Logan in a complete and finished state. In witness whereof the said parties have hereunto set their hands this 9th day of July, 1825. It is further agreed between Governor Pelly and Mr. Logan that from the period of the mill being delivered up to Mr. Logan Mr. Mitchel shall be transferred to him until the expiration of his present contract which takes place on the 1st of June 1826 for which consideration Mr. Logan shall pay the one half of Mr. Mitchel's expences to the estate of the late Earl of Selkirk from the time the mill is delivered until the first of June aforesaid. It is further understood that the ... Moulter for grinding shall be 10 p. cent i.e. if 10 bushels are ground one tenth shall be the allowance for the Mill. 1. A meal from which porridge was made.